A well fed and well watered thick lawn will crowd out weeds and be less susceptible to damage from pests and disease. Our bodies require fuel and adequate nutrition to function properly and fight off infection well so do our plants. In the first part of a two-week series I am sharing some tips on how to manage some of the problems that most commonly affect our lawns. Everyone has to battle some of the common problems I will talk about below but we can try to limit the problems with prevention. Last week I talked about how to keep the grass-green on your side of the fence and this week I want to talk about those pests that like to invade our grass such as the ever famous weeds. I have worked on many properties over the years and have dealt with each of the following problems multiple times. While it can be frustrating to look out your window and see a blotchy, sick looking lawn there are ways to repair without having to cost you an arm and leg. 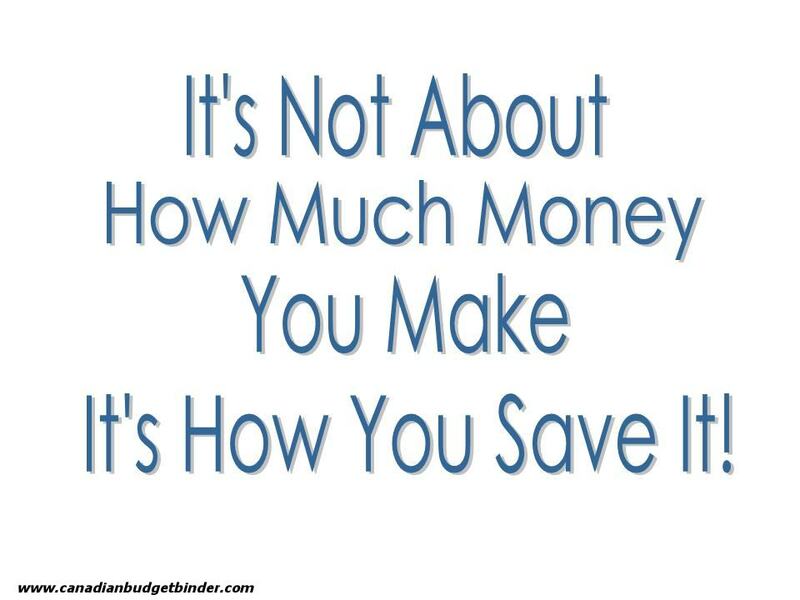 Preventative maintenance and proper care will get you a lot further in your quest for a perfect lawn. Grubs, commonly referred to as white grubs, are the larvae phase in the life cycle of various beetles. Most commonly white grubs are the larvae of Japanese Beetles, June Beetles and European Chafers. To identify what type of grub you have or to determine if you have a grub infestation using a container or some sort. A large metal coffee can works great. Remove both ends of the can with a can opener, push it down into the affected area of your lawn leaving a few inches above ground and fill with water. Any grubs in that area will eventually be floating in the water allowing you to have a look to see what kind of grubs you have. When grubs first begin to feed on your lawn will begin to turn brown and wilt. Once the number of grubs in your lawn grows you will begin to see dead patches throughout your grass. Since grubs feed on the roots of your grass the patches of grass affected will lift off the soil very easily as it no longer has roots anchoring it in the ground. The grubs themselves do not cause as much damage to your lawn as the animals that will tear your lawn apart looking for those grubs to eat. Skunks and raccoons are often the culprits when you find your lawn dug up, depending where you live you may have other animals to blame. While there are pesticides available for treating for grubs it isn’t always a necessary requirement. Milky spore is a soil dwelling bacteria that will attack and kill larvae of only Japanese Beetles feeding off your lawn. It can be purchased as a powder and spread over your lawn and is not harmful to any other birds, pets or insects it may come in contact with. Apply Milky Spore granules in the late summer or early fall when the grubs are feeding at the soil surface will ensure optimal results. Having a healthy lawn will again be your best defense against grubs. 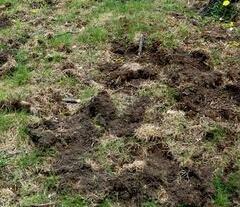 Grubs love soil that is compacted and undisturbed, such as a lawn. Aerating will not only reduce compaction and allow water, mineral and nutrients to flow freely but will also help to prevent the presence of grubs and the damage that comes with them. Damage done to your lawn can be repaired by laying sod or re-seeding the areas where the grass has died. Most grub damage will be seen in the spring so this is the best time to repair your lawn when the bulk of the damage will be done. Too much of anything is never a good thing and that is true again when it comes to fertilizing your lawn. Be sure to read the directions on the bag of fertilizer you have purchased for the recommended amount to be used. If you have any doubt regarding how much fertilizer to put down just always remember that less is more. The most important nutrient in lawn fertilizer is nitrogen (first of the 3 numbers on the bag). Too much nitrogen will burn your grass and encourages rapid growth and shallow roots that will contribute to the amount of thatch that builds up in your lawn. Most fertilizers require a good watering after it has been applied to your lawn, timing your fertilizer applications before an expected rainfall will help to keep your water bill down. Avoid fertilizing during really hot, humid weather as you chances of burning your grass are much higher. Fertilizer should only be applied when the grass is actively growing, applying fertilizer while your grass is dormant is only a waste of your time and money. Also avoid fertilizing during the day when the sun is hot as it may also cause your grass to burn. Using a proper fertilizer spreader will ensure an even application of fertilizer over your lawn. Dividing the amount of fertilizer you will use into 2 and going over your lawn twice aiming to make a checkerboard pattern will guarantee you don’t miss an area. An uneven application of fertilizer will be noticeable as you will have what appears to be stripes on your lawn as the fertilized areas will grow more rapidly than the areas you missed. A dog may be a man’s best friend but that is not the case when it comes to your lawn. Often dog owners find they brown patches in their lawn where their best friend went to relieve themselves. The best and easiest solution to this is to obviously keep your dog off your lawn though that may not be possible for all. Watering down the area where they went either with a hose or even just a glass of water will dilute it as it washes away therefore not killing the grass. Your dog’s urine is concentrated with urea which is a form of nitrogen which may burn your grass.The pH of dog’s urine may also be making this more of a problem for you and your wallet. The higher the pH (more alkaline) the greater the chance that letting your dog go to the bathroom on your lawn will have a negative effect on your grass. If this has been a major problem or concern for you having your dog’s urine tested to determine the pH may ease some of the work for you. A pH around 6.5 is ideal. The pH levels in your dog’s urine may also indicate other underlying health problems your dog may have or be at risk for. Covering the area with about an inch of compost may also help to re-balance the soil pH and reduce the amount of burn damage caused. What is considered a weed to one person may not be considered to a weed to someone else. A weed is basically defined as an unwanted plant that takes light, water, food and nutrients away from your desired plants. While there are some people who don’t mind the sea of yellow when the dandelions take over, there are many more people who can’t stand the intrusive plant. Dandelions may be pulled out by hand if you have the time and doing this before they set seed will slow down the chances of more spreading throughout your yard. Isn’t it amazing how quick those suckers pop back up after cutting the grass? It drives me nuts! If your municipal laws allow for it a selective herbicide may be applied, selective meaning it would only kill the weeds not your grass. Mechanically removing the dandelions by hand is more environmentally friendly and cheaper, if you have the time to do it. Always try to make sure you are remove the entire root so they just don’t grow back. I have seen many small dandelions that have had a 3 foot tap-root on them. Sometimes the roots break and you will likely see that dandelion growing new leaves again in a matter of a few days. Crabgrass has a slight resemblance to grass though it has much wider leaf blades and are also much coarser than the grass in your lawn. 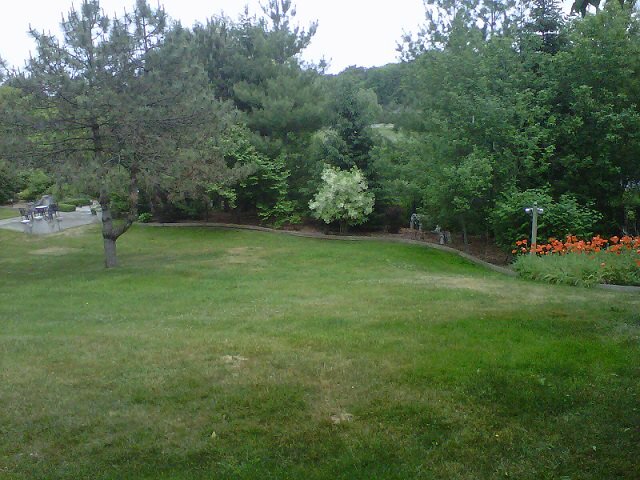 Crabgrass will also typically lighter in colour that the rest of your lawn. Large or ‘hairy crabgrass’ as it is often called will have noticeable hairs on the leaf blades where as small crabgrass is a smaller plant and lacks the presence of hairs. Crabgrass prefers undisturbed soil so a lawn is an ideal place for it to grow. 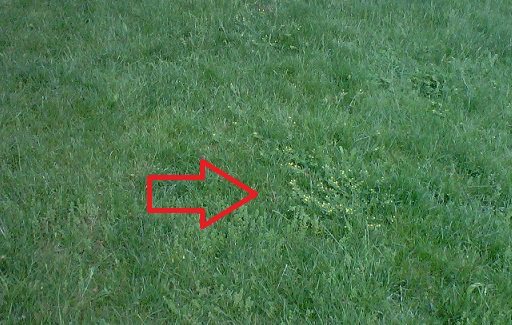 You must be diligent in your quest to remove crabgrass from your yard as it will be an ongoing process. One single plant can produce over 100,000 seeds in a growing season. Applying a pre-emergent herbicide in the spring will kill off any seeds that are just about to start germinating in your lawn. The frosts in the fall will kill off the actual plants but the seeds are able to overwinter and are just waiting to pop up once the snow is gone and it starts to warm up outside. It is a common practice to apply a pre-emergent herbicide for crabgrass when the lilacs are in bloom. A thorough-watering after applying the herbicide will ensure it is most effective. It is not likely that you will kill off all the crabgrass seeds in one application so re-applying will be a good idea to kill off the seeds that may germinate a little later than the others. Read the directions on the product for guidelines on how long you should wait to reapply. Avoid using pre-emergent herbicide on newly laid sod or grass seed as it will kill it. There are fertilizers that can be purchased that have a crabgrass preventer mixed in. This can be applied to your whole lawn but it should be applied to newly seeded areas and a few feet surrounding the new areas to prevent the seeds that are hanging around from the winter from germinating. If your lawn is severely infested with crabgrass removing the existing lawn and replacing it may be the easiest solution as it is very hard to kill off once it has taken over. Over-seed any bare patches in your lawn quickly before crabgrass and other weeds have a chance to make it their new home. Ensure you are watering your lawn thoroughly each time to promote strong growth of your grass’ roots. Crabgrass has shallow roots and light frequent watering will encourage their growth. Adjusting the height of your mower blade to the highest setting and leaving the grass a bit higher will deprive the crabgrass seeds of the light they need for germination. Pouring boiling water on crabgrass followed by covering the area with some compost and fill with grass seeds may be an option if it has not taken over your lawn. The boiling water will kill the plant and by placing compost and over seeding the growth of new grass will help to smother out the weeds. Regular cleaning of your mower blades will help to slow down the spread of crabgrass and other weeds. The grass clippings from the mower can be spread through your lawn distributing weeds all over the place. As you have read maintaining a healthy lawn is your best defense for preventing any damage and unnecessary stress for your lawn. Unfortunately we have no control over the actions of others and at this point there is no pesticide available for neighbours who neglect their properties. Remember when I talked about renting a goat to get rid of weeds? I wasn’t joking. All you can do is take care of your lawn and hope that they keep their weeds to themselves. Every year at Halloween I remind my kids to stay off other people’s lawns as the sidewalks and driveways are there for a reason. There is no need to cut across the grass and add more foot traffic to someone’s lawn that they may be working hard to maintain. Next week I will continue with this topic as they are a few other things to consider when identifying and dealing with problems in your lawn. Have you overcome any major problems with your lawn? Do you have any tips to share? Last month when my daughter had their field trip at “Naomis Botanical Garden”, I observed that their lawn is very well-maintained as well as the other plants and flowers. I asked their care taker what are their tips about doing a great job, she simply said that they always keep an eye on the place, they trim the plants and they put fertilizer.